Doug Weiner, Professor of History. the Koch donor network’s longstanding project to subvert democracy in this country. Raging Grannies were singing about corporate greed in the lobby before this forum tonight, attended by former House Rep. Bruce Wheeler, former State Senator Jonathan Paton and former AG Terry Goddard. Prof. Gibbs gave intro that the UA Freedom Center is funded by 1.8 M from the far right to create Dept. of Political Economics & Moral Sciences, led by David Schmidtz, who declined to debate him. Prof. Weiner said the Freedom Center was established in 2008 by Schmidtz and Philosophy Prof. Chris Maloney with $1 M /year for 5 to 10 years, but was misleading as to its donors, supposed to hire 4 faculty members for 25 years. Weiner said that the donors intended to check the credentials of faculty candidates. Ms. Parsons is graduate of George Mason University which received a lot of Koch funding that gave $ with plans to recuit & educate students through libertarian ideologies and think tanks. She mentioned Koch control over hiring and retaining a Chair at Florida State U. She emphasized the donor control over ability to withdraw funding, leverage annual payments, interference with hiring, creating curriculum/majors/minors and access to student info, plus mostly done in secret. Many universities now investigating these donor funds. 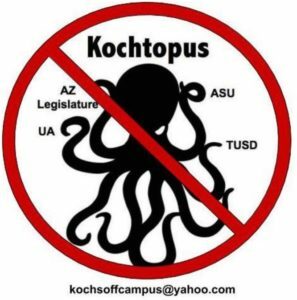 Koch Foundation has funded 491 campuses in U.S. Tucson Weekly Blogger David Safier (formerly with BfAZ) spoke of the high school courses funded by Koch $ at TUSD, Rincon, Pueblo, Cholla and in Amphi, Vail & Sahuarita school districts. Textbook by Schmidtz, self-published, based on $2.9 M grant over 3 years, with purpose of allegedly indoctrinating students about “decisions/ethics/micro economics/personal finance/entrepeneurship”. TUSD School Bd. has suspended this class for Fall 2018. 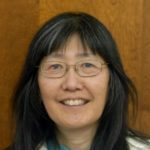 Prof. Vetter said that the Freedom Center tilts funding in certain directions, was wary of special interests funders with mandates. He was concerned about UA “oversight, priorities in subject matter and protections of academic freedom”. This Freedom Center is a new department, approved by Faculty Senate. Questions from audience: what examples of universities pulling out/rejecting this type of donations, or are universities only investigating? Mario of Freedom Center rebutted the discussion saying that their faculty does have peer-reviewed books, then Prof. Jonathan Anomaly of Freedom Center defended his research, said he was Jewish, explained his eugenics statements of the past, said his textbook was published by Oxford U Press. He walked out of the room at 8:45 p.m. Another question about what if Banner UMC had a donor to fund “septic surgery” would that be funded? Statement by woman with economic background saying she read the textbook and it did not mention 1929 or 2008 crashes, or famous economists. Nick Myers of Freedom Center said he was student and where was brain washing, wanted plurality of economic opinions & theories. Shanna, another Freedom Center student asked what is content of their classes that is at issue? BfAZ blogger Larry Bodine asked for practical steps to get dirty $ off campus? A U.K. woman/international labor scholar said to pay attention where $ was coming from, that it does affect the issues, esp. if secrecy involved. Lastly Marty said he had read about “Libertarian views of no such thing as common good, inequality not important, advocating limits on democracy” –is there any class to address what’s wrong with these views? Forum attended by about 150 people, ran overtime so it ended there, with responses from the panelists. Stay tuned for report from Larry Bodine. Thank you, great report for those who could not attend. When his name came up on this blog I looked up Jonathan Anomaly and read one of his papers. He clearly gets paid by the word. It was unfocused, but also an engineering feat of wordsmithing, because I can’t recall anyone getting that much hot air into print while failing to make any sense. These are con men and Koch puppets.